As I sat in the car the other day waiting to pick the kids up from school, I pondered, as I often do. This is good pondering time for me, that is, if I manage to stay awake – pondering time has often become napping time! Not that I’m knocking napping time – I think it has a place in every writer’s day. Anyway, I was pondering about relationships and how when things go wrong we often can’t see it coming. It kind of hits us out of the blue and we’re left quaking and wondering why. I was thinking about how, when this happens, by wondering we either a) gain some insight into the situation which leads us to try harder or think of ways to improve the situation, often requiring us to take action, or b) we get ourselves into a loop, feel ill, stressed, sand find it impossible to take action. But, even when we’re stuck at b) at some point we find our way to a), or the other party does. This led me to thinking about the process of writing and how similar it is… the way we can wonder, explore and absorb ourselves at a) or find ourselves kerfuddled and overwhelmed at b) before we manage to unravel the threads and before (joy of joys) the lightbulb moment hits us right between the eyes – POW! It also got me thinking that, when we write, we expect the words we first put down – the first draft – to be sooo gooooood. We are bursting with such fantastic ideas. “This is going to be the BEST book I have ever written,” we think. “This could even be a film!” Then we read it back – at least I do – and the moment happens – the quaking and knocked off your feet moment when you think, head in hands,“Oh noooo! This is pants!” And it’s not just pants, it’s huge enormous pants. The dialogue is stiff, there are plot holes everywhere, the characters are flaky and like an amalgam of half a dozen people we half know. We get disheartened (not surprisingly) and wonder how we can ever make it right. We get ourselves into a loop, feel ill… you know how it goes. But when you think about it, it’s just a draft like the rest of life, like those relationships and friendships, like all the things we need to reflect on and make better, because we need to see things WRONG before we can make them RIGHT. It’s getting things wrong that makes us ponder and ask those questions that need answering – not the self-destructive ones like “Who is going to read this rubbish?” but “Why isn’t this working?” And there’s a lot to be said for pondering. In fact, if writers were paid (by some writer god) by the hour, pondering time included, we could all give up our second jobs! It’s easy to be swayed by word count and to put pressure on ourselves to complete by a certain date, and this is all great if it motivates us. But for every hour spent writing, I reckon we need at least another to ponder, and that’s when the magic really happens – in your head first, and then on the paper. 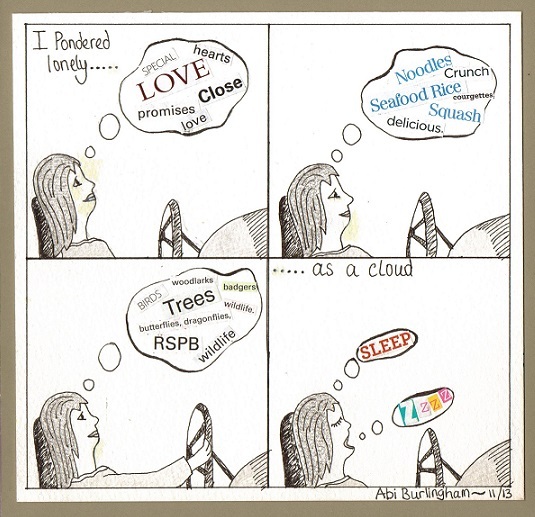 By the way, my pondering lead to the above cartoon, which I enjoyed doing soooo much that I plan to do more. Keep your eyes peeled for them! So here’s to pondering and not expecting perfection before perfection has time to grow. Do you allow yourself pondering time, and do you have a favourite pondering place? Pondering is the BEST! And I often say, my entire life is a WIP, so I can relate. Great great post, Abi! As a child, at school, I was frequently told to ‘Stop daydreaming’. I later realised that this was possibly the most destructive message I could have been given. Genius, Abi. Thank you. And exactly where I’m currently at (which you have a strange knack of doing) – so much so that my brain had to ponder aloud in the woods in order to make it focus on a tricky plot point that had been ongoing and which was making me angry and not want to continue writing the damned thing. Aw, bless you, Wendy. I’m glad it helped to ponder in the woods – I can’t think of a better place to ponder. Glad you sorted out your tricky plot prob too. Yep… and staring out the window… and lying in the bath after the water’s gone cold… etc 😉 Glad you enjoyed the post – thank you! Also, I love that second, third draft feeling when it all starts coming together, and you get to flesh out the characters, and cut the rubbish, and watch it all begin to work! It’s fab pondering time isn’t it, Lisa? I tend to come up with blog post ideas while waiting to pick the kids up too. I agree re 2nd and 3rd drafts – they are lovely!